If you haven't read about Robert and Braden's upcoming two-month stay at a Sudbury school in Denmark and how they will represent Clearwater at the European Sudbury Conference in Berlin this spring, do so now. They hope this trip will encourage more travel and student exchange between Sudbury schools around the world. 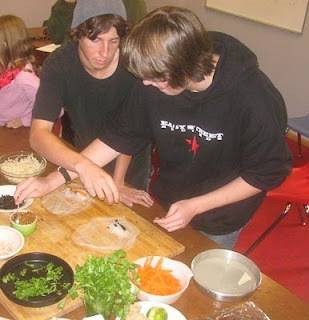 To earn money for their trip before they leave at the end of the month, they (together with staff member and cooking mentor Mat Riggle) will cook a sumptuous Asian-themed meal with dessert on Saturday, March 20 from 4:00-7:00 PM at The Clearwater School. If you would like to eat delicious food, enjoy good entertainment and support them on this adventure, please RSVP no later than March 18 to The Clearwater School. The cost is $20 each for adults and $10 each for children. Please indicate in the RSVP if you have any diet restrictions and, if eating meat, whether you prefer pork or chicken.